Anthemion Software Ltd. is an independent software house based in Edinburgh, Scotland. Our aim is to provide exciting applications to help harness your creativity - without distracting you with complexity or imposing arbitrary constraints. Check out the personal web sites of directors at HarrietSmart.com and JulianSmart.com. Writer's Café is a toolkit for writers that runs on Windows, Linux and Mac. It's built with wxWidgets, a project started by Anthemion's Technical Director, Julian Smart, and designed and actively used by Anthemion's Creative Director, Harriet Smart, author of five novels published by Headline. DialogBlocks is a sizer-based GUI resource editor that quickly gets you creating professional-looking dialogs, wizards and frames for deployment on Windows, Linux, Mac or any other supported wxWidgets platform. 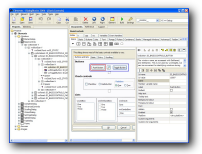 HelpBlocks is a cross-platform HTML Help editor that generates online help for wxWidgets applications. Julian Smart is the main author of the first book about wxWidgets, published by Prentice Hall. You can buy it from Amazon in the UK by clicking here.